Gratis spa gear (towel, mineral water, flip-flop, swim cap, 2-in-1 shower gel/shampoo. Payment: with PayPal: from your PayPal balance, or using a Bank Card, Credit Card. After payment you will automatically receive your E-Ticket! 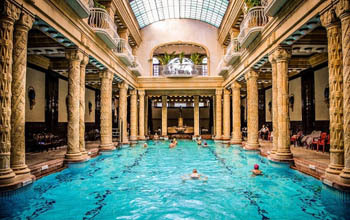 Relax in two of the most famous thermal baths of Budapest, the Széchenyi and the Gellért, with our special package that includes taxi transfer to the baths plus complimentay gifts. 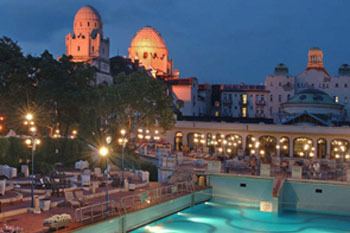 Both baths look back to more than a century history and the thermal pools are filled with water supplied by medicinal hot springs rich in minerals. 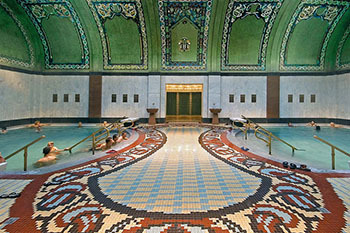 The two spas also boast stunning architecture making them the city’s top landmarks. 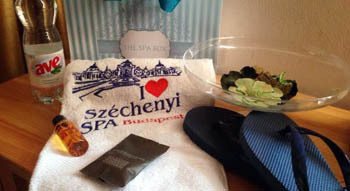 Why Buy the “I Love Budapest Spa” Package? No need to stand in line to buy entry tickets! A memorable and relaxing time in a renowned medicinal spa. Address: Kelenhegyi út 4., Budapest 1118, district XI., Buda side – within the Danubius Gellért Hotel next to the green Liberty Bridge and at the foot of the Gellért Hill. Opening Hours: every day: 06.00 – 20.00. Help Desk opening hours (our staff will greet you here, help you find your way around the spa and provide general assistance): every day: 09.00 – 18.00. Your ticket is valid till closing time, until 20.00 on the chosen date. 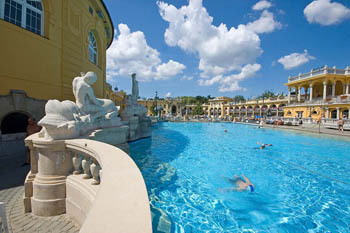 outdoor thermal pool (36 °C). The bath offers numerous services and massages ( from 20′ to 50′ long) too: herbal bath, Cleopatra bath, relax aroma bath, aqua fitness, sauna sessions. The ecclectic yellow building sprawling in City Park was finished in 1913. 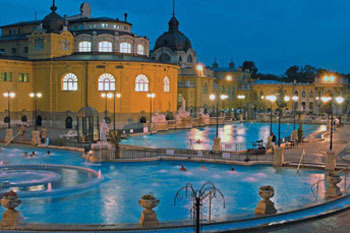 The Szecska, as commonly referred to by locals, is one of the largest spa centres of Europe. 2 more immersion pools (indoor: 18 °C). Similarly to the Gellért, you can also get massage treatments at affordable prices, enjoy the sauna, or take part in aquafitness. If you get hungry after soaking in the water you can grab some coffee/tea and snacks in the cafe. for a more upscale meal try Gundel at just a short walk, right next to the Zoo and Botanical Garden. 0,5 L Ave still mineral water. 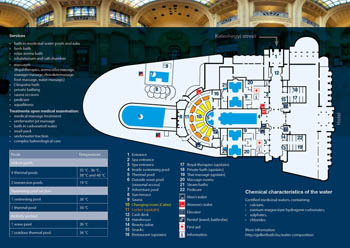 TIP: You can buy entry tickets with cabin use/massages to the Gellért and the Széchenyi Bath. 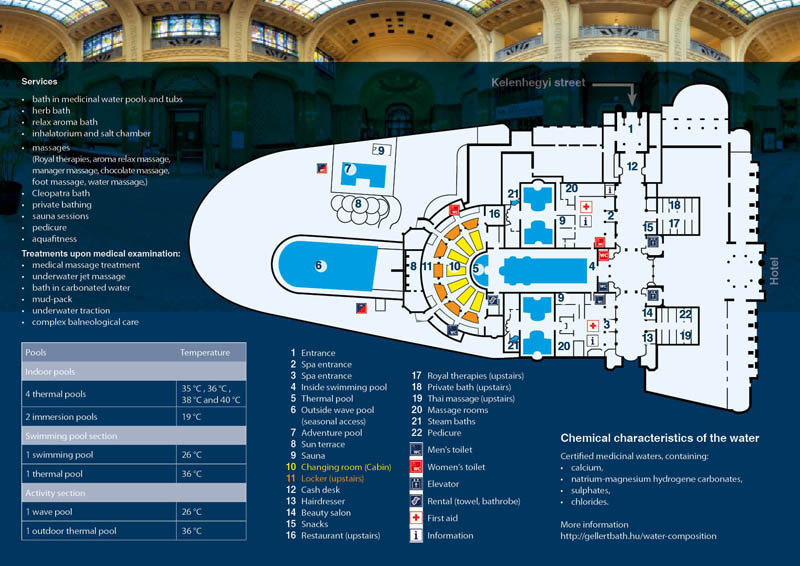 Please present it in print form or on your mobile/tablet to our staff at our Special Help Desk in the Gellért and Széchenyi baths.